Designed with one of my male students in mind, these cozy moc style slippers are great to work around the house in. The toe-up design wont bother sensitive feet and the secure fit wont trip you up. 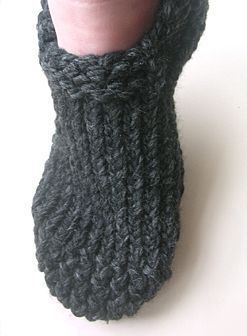 The slipper pictured is made using Lion Brand Thick N' Quick yarn.